So here we are again, supporters of Tibet preparing to commemorate the Lhasa Uprising of March 10, 1959, a day on which many Tibetans were killed during a courageous resistance against Chinese rule. The event will be marked by rallies, and marches, at which folk can demonstrate their solidarity with the people of Tibet, and remind the world what Tibet’s cause is all about. An objective reflected by the display of Tibet’s national flag and the raising of banners and placards demanding independence. 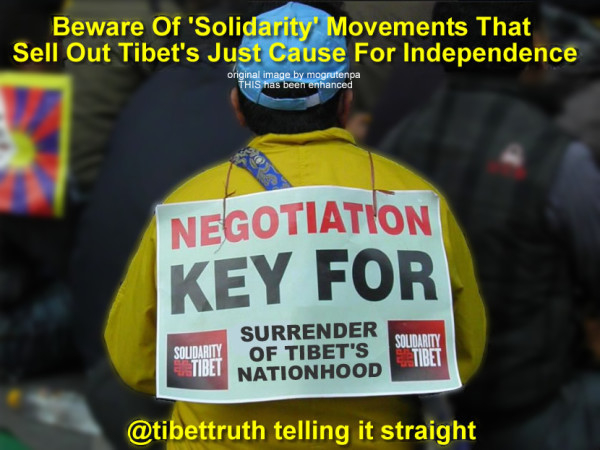 Behind the appearance of unity however not all those who proclaim to support Tibet uphold the goal of national freedom. As we have witnessed previously rather than affirming the Tibetan people’s right to independence, we can expect some to distort, marginalize or ignore entirely the political aspirations of Tibet’s struggle. Prominent organizations who declare themselves dedicated to Tibetan freedom will assiduously avoid any reference of Tibet’s independence. They will endorse instead (the official line of the exiled Tibetan Administration) for negotiations with China on the basis of accepting marginal improvements in autonomy while leaving Tibetans under Chinese rule. Those protests such groups do organize on the day focus on culturally related topics or other human rights issues (not though the subject of China’s forcible sterilizations, another taboo subject). While these are credible areas of concern such a diluted and selective protest is a long way indeed from the demands and inspiring sacrifices of Tibetans inside Tibet. Who, risking torture and prison, take to the street to assert their nation’s freedom. To anyone freshly arrived to the Tibetan cause this must seem a confusing and troubling polarization, and people are right to ask why it is that Tibetans inside occupied Tibet are struggling for independence while Tibet related groups enjoying freedom in the West are promoting campaigns that run counter to the very aspirations Tibetans are being viciously abused and oppressed for. Let’s take a look see at what’s behind this disabling schism, there are two areas of influence long thought to be responsible. Firstly, the exiled Tibetan Administration, which is engaged upon a course of appeasing China’s regime to encourage talks on so-called ‘meaningful autonomy’. It’s entirely intolerant towards Tibet’s independence, regarding the issue as a barrier to progressing negotiations with the Chinese regime. Through a developed network of contacts, and aided by a conformist and largely compliant exiled Tibetan society, the Administration finds it an easy task to deflect, control, and influence protests, to ensure the desired message is presented. 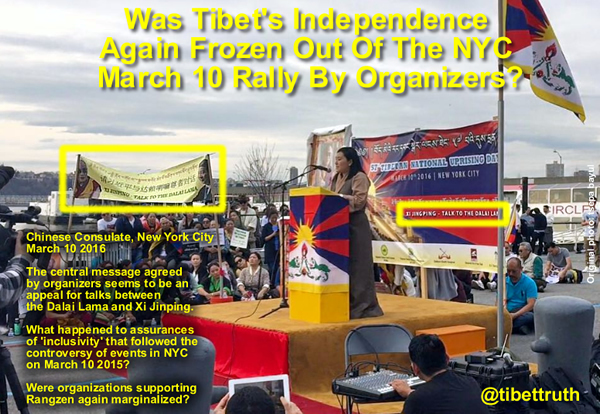 Evidence for such orchestration manifests itself on March 10, we have reported upon, challenged and exposed a number of such actions, rallies at which there will be virtually no allusion to national freedom for Tibet. Carefully arranged banners that call for ‘talks with China’ others openly declaring ‘Tibetans want autonomy’. Speeches that while honoring the sacrifices of Tibetans propose ‘solutions’ that betray the rightful demands of Tibetans inside Tibet. 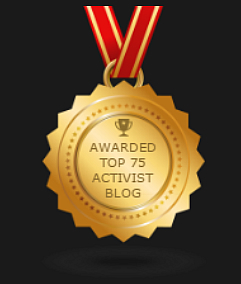 What of the majority of individuals supporting Tibet, are they oblivious to such manipulation? Unaware that the central message of such protests conflict with the objectives and courageous sacrifices waged by Tibetans inside occupied Tibet? Innocence of such dark currents or an unfamiliarity of exiled Tibetan politics would explain such an unknowing. The same cannot be said however of those who assume responsibility for arranging rallies on March 10. Such organizations are acutely aware of the nature of the Tibetan struggle inside Tibet, and conscious that Tibetans face vicious reprisals for demanding their national freedom, yet have resisted China’s tyranny to assert that right. Given this reality you may feel it’s kinda hard to understand why such bodies would meticulously assemble protests, yet consistently fail to give prominence to the common political aspiration of Tibetans in occupied Tibet. But then if they are operating to an agenda, one opposed to to Tibetan independence, the situation would be a whole lot clearer, right? A second corrosive influence is that exerted by foreign governments, which it should be remembered have an invested and vested political and economic interest in maintaining positive relations with Beijing. 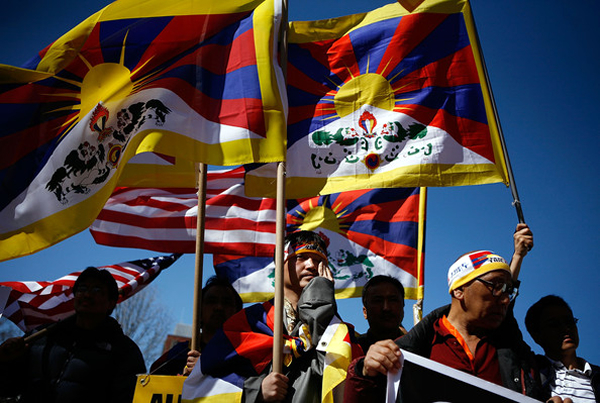 Implacably opposed to the notion of an independent Tibet, authorities like the United States would not welcome across American cities a unified, forceful struggle for Tibetan nationhood. A prospect that would be considered an injurious distraction for its diplomatic outreach to China. 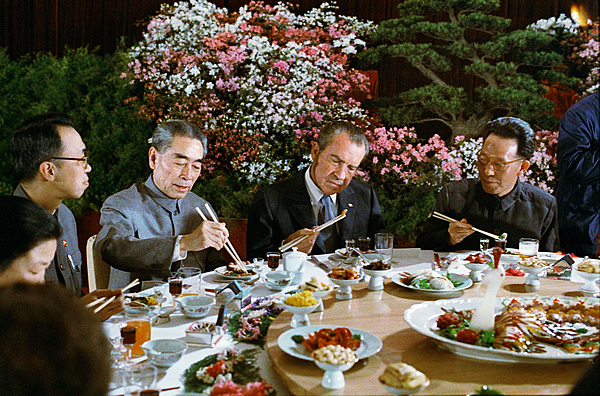 Having followed a policy that submits to China’s bogus claim of sovereignty over Tibet (an acknowledgment that came to prominence following Richard Nixon’s rapprochement with China in 1972) and urged Tibetans to concede to Chinese rule, in exchange for so-called meaningful autonomy, the State Department has long rejected Tibetan independence. Since officials within the State Department regard this to be a matter of extreme sensitivity to China, it is within its political interests to have a presence within the wider movement for Tibet, and in particular to exert, where possible, an influence to dilute or silence any actions supportive of Tibet’s national freedom. 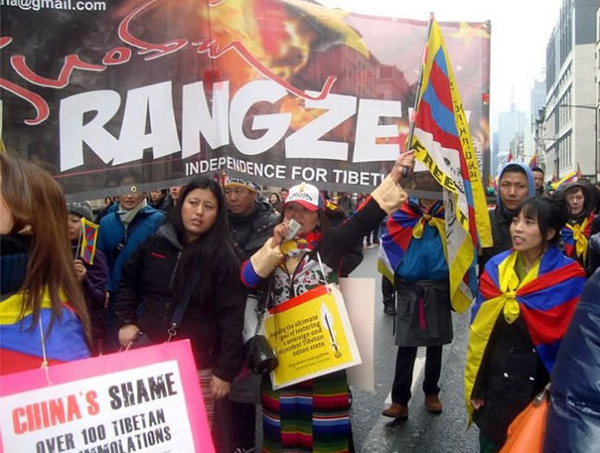 Without considering the censorial agenda of those opposed to Tibet’s independence it’s tough to identify a reason why, at such protests, organizations consistently exclude even the slightest reference to Tibetan sovereignty. 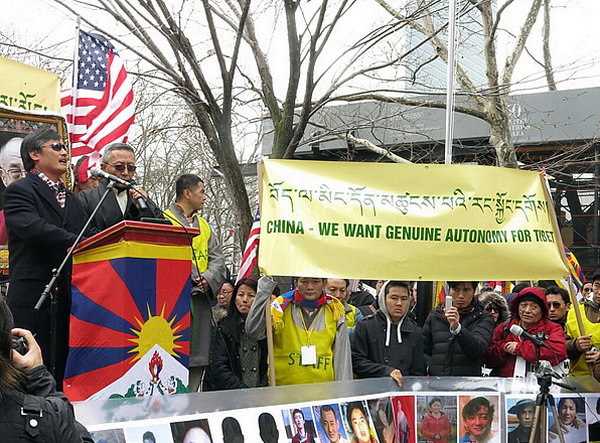 If pressures are being applied to suppress the issue, it denies people, who in all good faith and innocence participate in such protests, an opportunity to channel the genuine political aspirations of Tibetans in occupied Tibet. On March 10th, a date of primary importance for Tibet’s people, to deliberately marginalize or conceal the very goal of Tibetans suffering China’s tyranny is an act of callous deception. If you are attending such protests please consider the struggle inside Tibet and express your support by having a placard, banner, or flag that informs people what is being sought, Independence for Tibet!